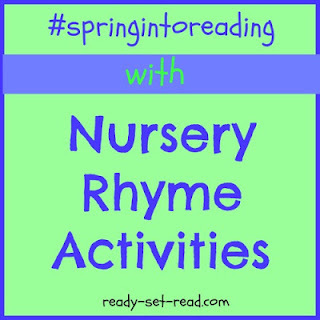 Nursery Rhymes are frequently used by preschool teachers in the Spring because so many of the themes in the nursery rhymes fit well with the themes of Spring. We've been exploring some of our favorite nursery rhymes here for the past 5 days. I've saved the best for last as we are talking bunnies today!! Today's nursery rhyme is Little Peter Rabbit. We had fun retelling this book with props. 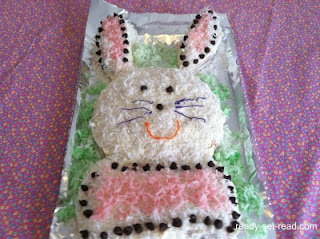 We also enjoyed making a bunny cake. My mom always made this cake when I was a kid, so it was fun to make with my boys. 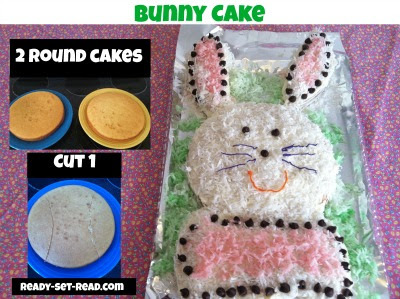 I had promised to do a free cut and paste book for Little Peter Rabbit. I always try out my activities with my kids before I publish them. To be honest, my activity was terrible. After a lot of fretting over how to improve the lesson, I had to just scrap it. If I come up with something that all of you fab teachers would find worthy to use in your classrooms, I'll add it to the post later. For now, I'm going to be a reflective teacher and not post it. sorry! (You can snag a freebie if you visit the A Tisket, A Tasket post). 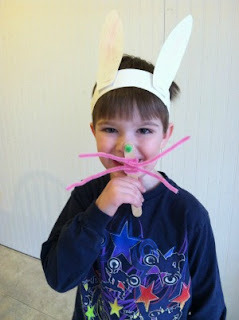 After learning the nursery rhyme, "Little Peter Rabbit", we acted it out with some props. 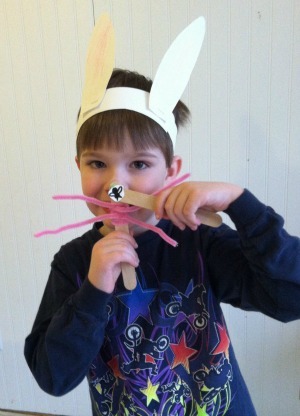 Logan had made these bunny ears, nose and whiskers at preschool. We added a fly that I hand drew (super simple) and glued to a popsicle stick. The boys can put the fly on the nose or take it off as they sing the nursery rhyme. Tyson is practicing prepositions, so we also altered the verse of the nursery rhyme and sang, "Little Peter rabbit had a fly above his ear." or "Little Peter rabbit had a fly behind his back." Then we tried to figure out where to put the fly. We've enjoyed our nursery rhyme activities this week. If you missed any of the nursery rhymes, you can find the entire series on the nursery rhymes for Easter page. Also, The Good Long Road featured an awesome Nursery Rhyme activity for the Itsy Bitsy Spider this week. Jennifer, from The Good Long Road, shared how to use this on our google + hangout on Playful Storytelling last week. This nursery rhyme will carry you right through into April Showers, so it is a great one to add in at this time of the year!